A few days ago, BK the project manager walked into my office beaming with joy. He just completed the deployment of a large wireless network while beating budget and milestone targets. But he complained of being stung by an insect and had a large welt under his left eye. The sting reminded me that according to the Chinese Almanac, that day was destined to have poisonous insects rising out of their winter hibernation and bugging people. Apparently, one of them got BK. 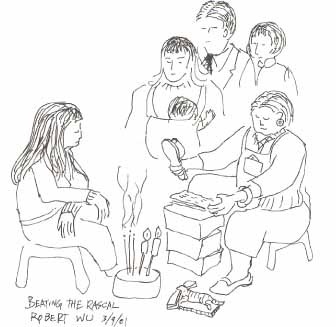 On this day each year, some Hong Kong people who feel strongly being wronged would seek solace from the folk practice of “beating the rascals”. This is really a form of exorcism that symbolically punishes the wrongdoer and soothes an injury or rights an injustice. Most people would refrain from this practice believing it would also reduce one’s own fu, or blessedness and well being. On the sidewalk one block from my office, a dozen old women were busy “beating the rascals” for paying clients on that day. Each old woman would sit on a stool in front of burning incense and candles, a ceramic tiger with a piece of fat pork in its mouth by her side. There were lines of clients waiting patiently for their turn to salve their wounds. A client would sit down on a stool, pay the old woman the equivalent of US$5, and whisper a name to be worked on. The old woman would put a piece of printed paper on a brick and beat it with an old slipper as she mumbles admonitions. I could not hear her, but I could imagine her words: “Johnny, Johnny, you baaaaad, baaaaad boy. You did a baaaaad thing and I am going to whack you reeeeeally good”. After a few minutes, the old woman would fold the piece of savagely beaten paper into another piece of paper shaped as a tiger. The lot would then be lit and burned. While this practice borders on voodoo, it is a socially accepted form of venting anger in Hong Kong. In this high-strung city, this pressure relief valve probably soothed many people who may otherwise resort to more violent forms of action. Posted by Robert Wu on Friday, March 9, 2001, at 11:56 pm. Filed under Uncategorized. Follow any responses to this post with its comments RSS feed. You can post a comment, but trackbacks are closed.